With all the uncertainty in today’s world, having a gun to protect you and your family is a great idea. But owning a gun is a responsibility that needs to be taken seriously. Storing your gun in a safe under your bed is a great way to combine having your gun within arm’s reach in case of an emergency and keeping it safe, either from burglars or from any children in the home. But finding the best under bed gun safe is not an easy task. So to try and make it easier, we put in countless hours of research and reviewed all the different options on the market to find the best under bed gun safe available. Our rigorous review process led us to the Stealth Defense Vault DV652. 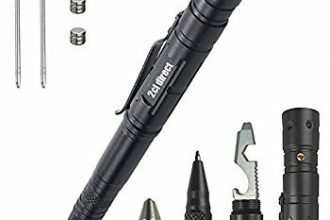 It has a convenient and reliable locking mechanism, it is easily mountable to increase security, it has plenty of space inside to store multiple guns and it is affordable compared to other options. To buy the best under bed gun safe available on today’s market, get the Stealth Defense Vault DV652 now. As gun owners, we understand the importance of safety. While gun ownership is a right guaranteed by law, it is still a responsibility. And we take this very seriously. Yet we also appreciate that guns are designed to be used. Whether for sport or defense, proper preparation is essential. So we want to make sure gun owners are taking all the necessary steps to keep their guns safe without making them useless. This is why we are so concerned with helping you find the best under bed gun safe on the market. Also, our reviews focus heavily on value for money. We agree with the ‘you get what you pay for’ statement. But we don’t agree with the idea that spending the most money means you’re getting the best. We put in the hours to eliminate both the overpriced rip-offs and the cheap garbage, providing you with options that offer the most value for money. Storing your guns in a safe is essential. Keeping them locked away makes sure no one entering your home can get them. If someone breaks in and finds your guns, it kind of defeats the purpose of having a gun in the first place. It’s also important to keep guns in a safe in case there are children in the home. 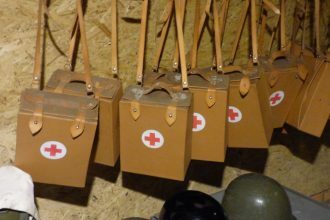 We have all heard those disaster stories that occur when a curious kid gets their hands on a gun in the house. These situations need to be avoided at all costs. 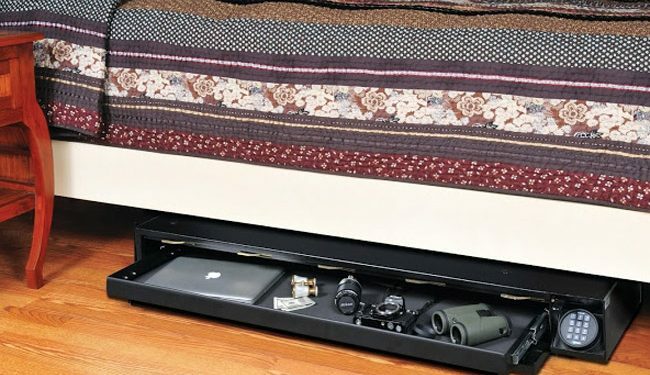 Having an under bed gun safe gives you this level of safety and security while also keeping your guns close by. In the event of an emergency, such as an intruder, you can instantly access your guns by going under your bed. This combination of safety, security and convenience help make under bed gun safes a must have for gun owners. To find the best under bed gun safe, we carried out a systematic review of the countless different options on the market. The first thing we did was to look at what others are saying about the top choices available. We eliminated anything that had received multiple negative reviews for legitimate reasons. Afterwards, we compared the top options using a specific set of criteria, throwing out those that didn’t meet our expectations. We then got our hands on a few and tested them out ourselves. When you think of a safe, you should think of something hefty and strong. There is no need for a lightweight safe. You want to put it in one spot, and you should expect to not move it from that spot. Be cautious of safes that advertise being portable. If you can move it, so can someone who has entered your home. You’ll also want to look at how many guns you can fit in the safe. It is a good idea to get something that can fit more than one gun, even if you only own one. You may buy more down the road, and you don’t want to have to buy a new safe if this happens. One of the most important things to look for in a safe is the material used to make it. You need something strong that can withstand shocks. Also, you’ll need something that will not fail when someone tries to break it. The best material you’ll find on the market is 10 or above gauge steel. This thick steel will give your safe all the strength it needs. The main function of your under bed gun safe is to protect your guns. Therefore, the mechanism used to lock the safe is probably the biggest thing to consider when buying your safe. The classic way to lock a safe is with a key. However, this is not very common anymore. You could lose the key or someone could duplicate it. They are often not the best way to close the safe. Some of the newer safes will use biometric fingerprint scanners. These sound great but are often unreliable and even more often very expensive. A key to finding the best under bed gun safe is the way it is secured. Some safes go under the bed and are secured with a cable you lock around the bed frame or bedpost. These aren’t great, as these cables can easily be cut with a pair of bolt cutters (something you can expect most intruders to have). The best thing is when the safe can be screwed to the bottom of the bed. Usually the screw holes are inside the safe, meaning the only way to take it down is by opening the safe. This adds an extra layer of security. It also makes the gun safe a bit more convenient, as it will always be in the same spot. The first thing we did in our review was take a look at what others have said about the different safes on the market. If a particular safe had less than a 3.5 star review, we investigated further and threw out those that had serious flaws. The first thing we looked at to start narrowing the list was the degree of security provided by the safe. Some options include foldable doors or are made from a weaker material, such as plastic. These options fall short out our expectations for the best under bed gun safe. We want something that cannot be broken into under any circumstance. The highest-rated option that we threw out for not being safe enough was the ECR4Kids Lock and Roll Portable Under-Bed Personal Safe. The next thing we looked at was the size of the safe. While you want something small enough to fit under your bed, you also want to be able to fit a few different guns inside. 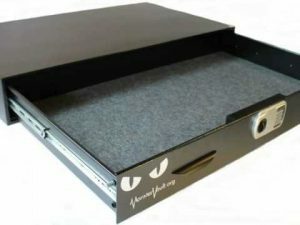 We eliminated options, such as the Vaultz Locking Storage Box, because they are simply too small. Our last round of eliminations was based on whether or not you can mount the safe to your bed. We consider this to be an essential feature because it allows for an extra level of security. If the safe isn’t mounted to the bed, it is usually secured by a cable. This wraps around the bed frame and locks, but this is nothing a pair of bolt cutters can’t take down quickly. We don’t want to take any chances when it comes to securing guns. Those that were eliminated on these grounds were the Secure IT Fast Box Model 47, the SnapSafe Under Bed Safe 75400 and the SnapSafe Under Bed Safe 75400. 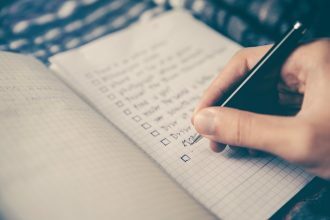 After going through all the safes on the market and eliminating some because of their reviews and others because they didn’t meet our criteria, we set out to test some ourselves. In total, we tested five of them, and this process has led to our recommendation for the best under gun safe. 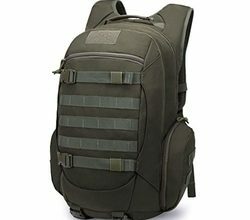 The Stealth Defense Vault DV652 has really got it all. It’s strong and durable, it’s got an effective and safe locking mechanism, it’s big enough to fit a few guns, and it can be easily mounted to your bed for extra security. All in all, it is well-deserving of the title of best under bed gun safe. This safe is made entirely from 14 gauge steel, meaning it is made from one of the strongest materials out there. You do not need to worry about someone breaking in or busting the hinges. This thing is strong. Additionally, the electronic keypad system offers a nice balance between convenience and security. Set an easy-to-remember password and then all you need to do in a moment of need is punch in the code and go. This safe is also plenty big enough. Photos from the manufacturer show a rifle and a handgun in the safe, but we found it could easily fit more. You could store two full-sized rifles and two handguns without an issue. Lastly, this safe can be easily mounted to your bed frame. This will lock it in place, keeping it in the same spot and adding an extra layer of security. The mounting holes are found inside the safe, so you don’t need to worry about anyone taking the safe down. There’s not much to dislike about this safe, but one thing would be the electronic keypad. By itself, it works fine, but it depends on batteries. If you were to forget to change them, you could find yourself locked out of your safe. Your best bet is to put reminders in your calendar to change the batteries once every six months no matter what—just like your smoke alarms. This will ensure you are never caught in a situation where having no power keeps your guns out of reach. Also, this safe isn’t exactly cheap. However, it is right around the average for gun safes of this size. And we’re talking about gun safety. It is better to spend a little extra money and get the best than to skimp and end up regretting. 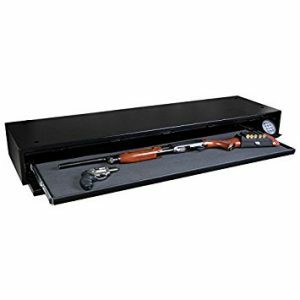 If you are looking for the best under bed gun safe, one that is strong, reliable, big and secure, then get the Stealth Defense Vault DV652 now. Some of us might be looking for something a littler bigger. Either you only have one gun safe, the one that goes under your bed, or you simply want to have quick access to more of your firearms. This safe is huge. It has a slide out drawer that is 28” x 48”. This is enough space to fit several rifles, handguns and any other firearm you may have. There is also enough space for you to store other valuables, such as jewelry or documents. The electronic keypad and mounting system make this safe just as secure as any other on the market. You’ll be able to lock it in place and then as long as you remember your code, you’ll be able to get into the safe at a moment’s notice. The first thing that jumps out about this safe is its price tag. Most places have it for over $600. 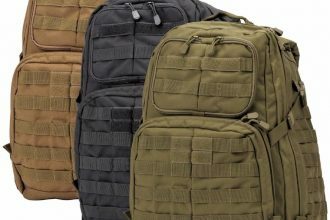 While it is plenty strong and durable, and it offers much more storage space than competitors, it is hard to justify this amount of money. Unless you absolutely need the space, this might just be too much to spend. Also, for the money, the materials here aren’t the best they could be. The top and bottom are 11 gauge steel and the sides are seven. Sure, this is plenty strong, but considering our choice for the best under bed gun safe had 14 gauge steel all around and costs several hundred less, it’s frustrating to see these materials in this safe. If you have lots of guns or are planning on buying more and want one under bed gun safe to store them all, get the MonsterVault Under Bed Safe now. Keeping your guns safe and accessible is just as important as having them in your possession. One way to do this is by keeping them in a safe under your bed. However, with so many different options out there, it’s hard to find the best under bed gun safe and to tell if you are paying for quality or getting ripped off. So, to stop this from happening, we put in the time to review the different options and find the best under bed gun safe for you. Our detailed review process led us to declare the Stealth Defense Vault DV652 as the best under bed gun safe on today’s market. 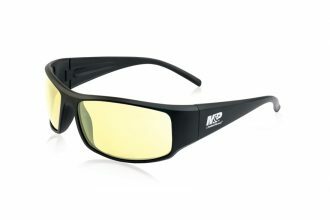 It’s strong, reliable, easy to use and large enough for multiple guns. If you want the best under bed gun safe to keep your guns safe but within arm’s reach, get the Stealth Defense Vault DV652 now.